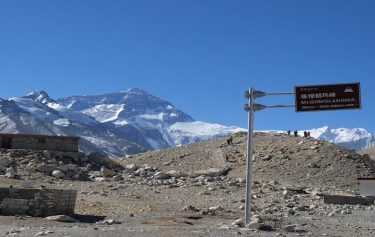 Everest Base Camp via Lhasa is an easy and the best alternative tour to the base camp of the Mt. Everest (8848m) from Tibetan Plateau. Most of the trekkers go to the Everest Base Camp from the Khumbu region of Nepal which requires more days and tough walk. If you want to experience the chilled and adventure environment of the Himalayas with easy drive and avoiding the long days trek, this is the best tour for you. This Lhasa Everest Base Camp Tour also offers you the historic monasteries and Tibetan culture in Lhasa and several town, villages and valleys on the route. 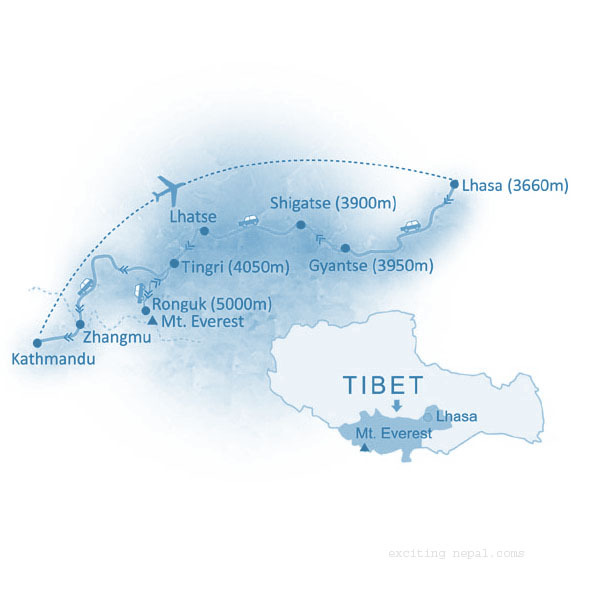 Commence with a spectacular flight over the Himalayas followed by a comprehensive insight into Tibetan culture with visits to all the famous sights and monuments within Lhasa and its surrounds. 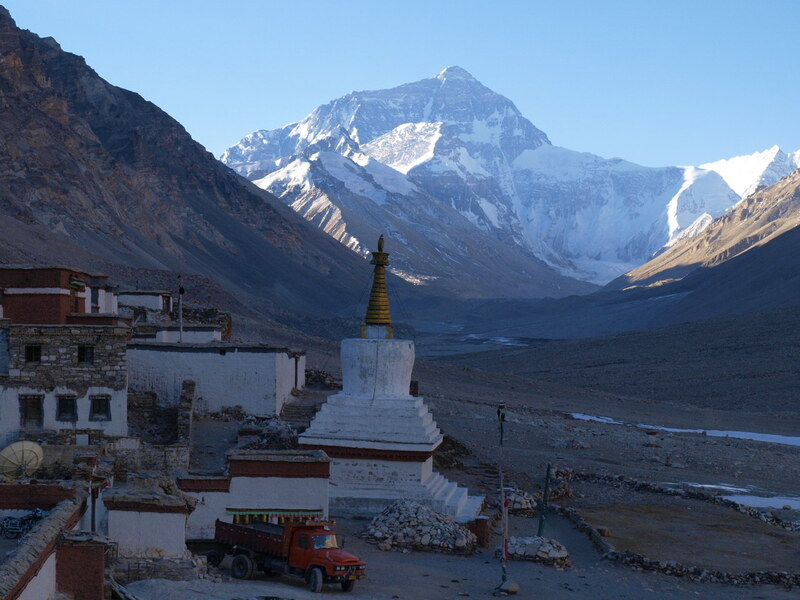 Commence an overland journey by Land Cruiser to the famous Monastery at Rombuk and an excursion to the Base of Everest visiting a number of important sights of historical interest on the way. 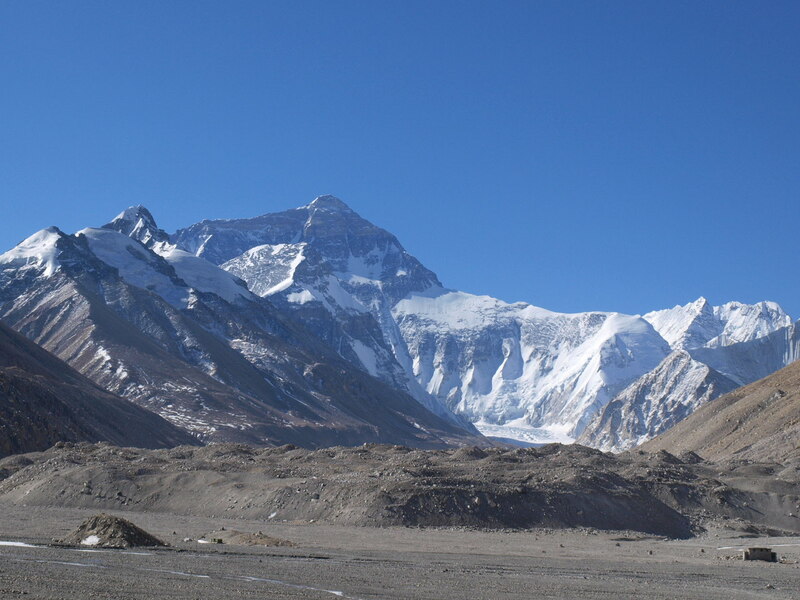 The Tibet with Mount Everest Base Camp Tour is a very comprehensive tour of Tibet with exploration visit to the cultural, historic and natural attractions of Tibet. 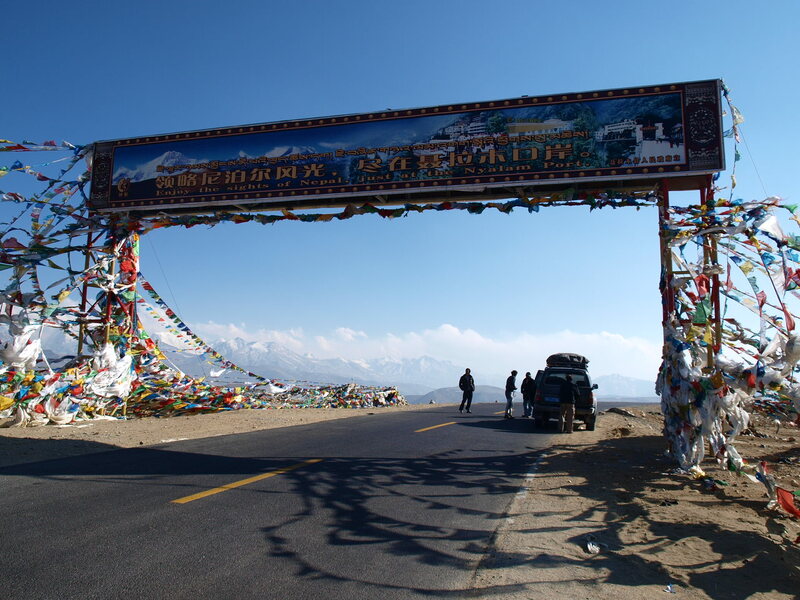 The tour covers most of the interesting places and monuments in Lhasa and southern Tibet. 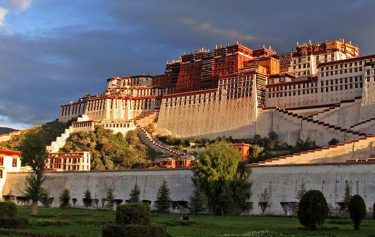 After flying in to Lhasa from Kathmandu, enjoy the guided sightseeing tour of the cultural and historic sites of Lhasa. 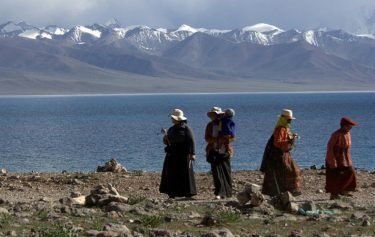 Afterwards drive overland, in 4-WD jeeps, across the Tibetan highlands and high passes to the fabled Rombuk Monastery and Mt. 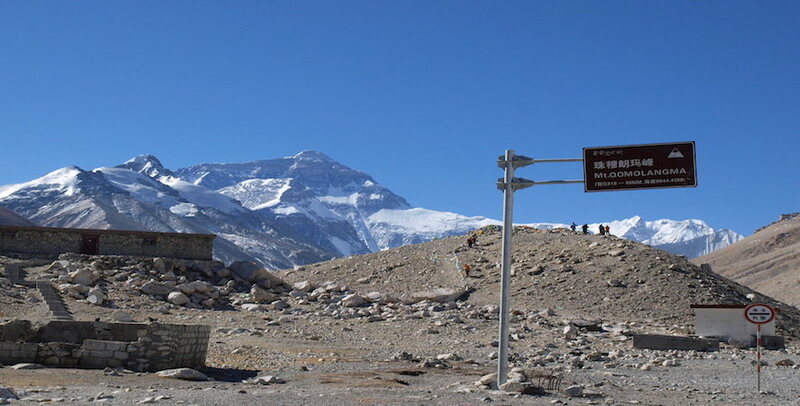 Everest Base Camp from where the view of the great North face of Mount Everest is the most spectacular views. We will fly back to Kathmandu from again from Lhasa airport on the day eight. Trip Highlights Everest Base Camp Via Lhasa fly in fly out. Eye-catching views of Mt. Everest, Cho Oyu, Shisapangma, Exploring Rongbuk glacier, Ronbuk monastery, tranquil Yamdrok lake, Kumbum stupa, Phalkor and Tashilumphu monastery, explore fascinating city Lhasa with cultural heritage of Potala palace, Sera and Drepung monastery, Jokhang temple, Bharkhor market. 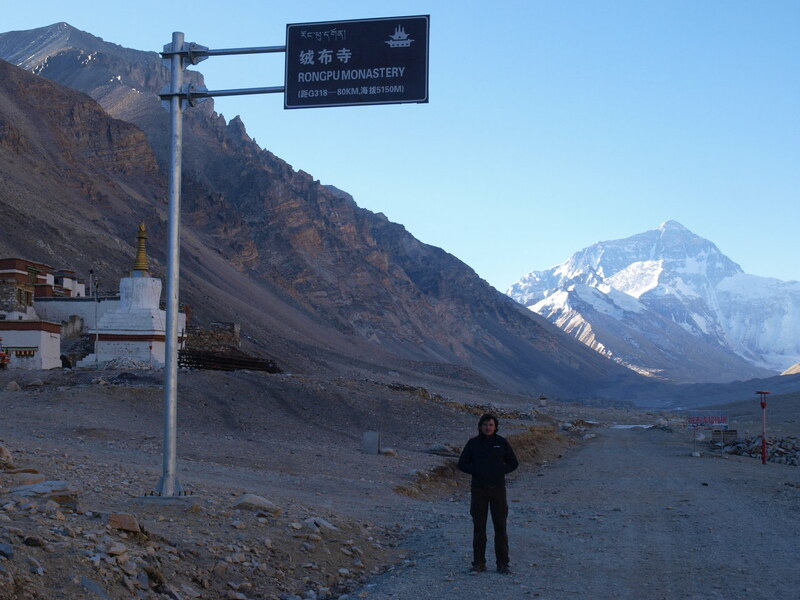 Day 08:- Lhasa to Kathmandu or China. 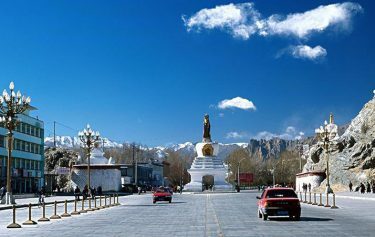 Day 02-03:- In Lhasa: Two Full Days Sightseeing Tour In Lhasa. Drive to Gyantse via Yamadroke Lake and high passes: Kora LA (5,010m) & Kamba La (4,794m) – Sight-seeing in Gyantse including Pholkor & Kumbum Monastery. PM: scenic drive to Xigatse(1.5hrs) through the typical Tibetan Countryside – Yak Hotel. Both way flight tickets from Kathmandu-Lhasa - Kathmandu.